First there was ‘organic’, then ‘local’ and ‘seasonal’ – words that suddenly began to make regular appearances on restaurant menus and shopfronts. They seem to promise safety, quality and wholesomeness – things we suspect are increasingly rare characteristics of ‘normal’ supermarket foodstuffs. Another has joined them; "artisanal". Though without official definition, artisanal conjures something of the past - a time before factories when things were made by hand rather than machine and requiring only a few, skilled workers. Perhaps most importantly, it promises production at a small scale, a factor often associated with sustainability. The truth is, technology and sustainability, or technology and quality, do not have to be mutually exclusive. Technological innovation has done wonders for food production and producers throughout history, saving time and back breaking labor and improving product quality. The fact that it has also standardised and sanitised food, removed hands from the soil, and taken people off the land as increasingly sophisticated machines replace human labor, means its long term rectitude is debated extensively. As with all things, I feel it is wise to encounter and investigate before discounting the value and virtue of a thing. An old friend who knows me well, recently provided the opportunity to do just this, by gifting me a tour of Standhill farm; my local producer of almost-organic tomatoes, for my birthday. In matters of scale and technology, Standhill is the antithesis of ‘artisanal’. After winding along narrow, scruffy lanes in the deepest Borders, it is a genuine shock to arrive at such a sea of steel and glass. 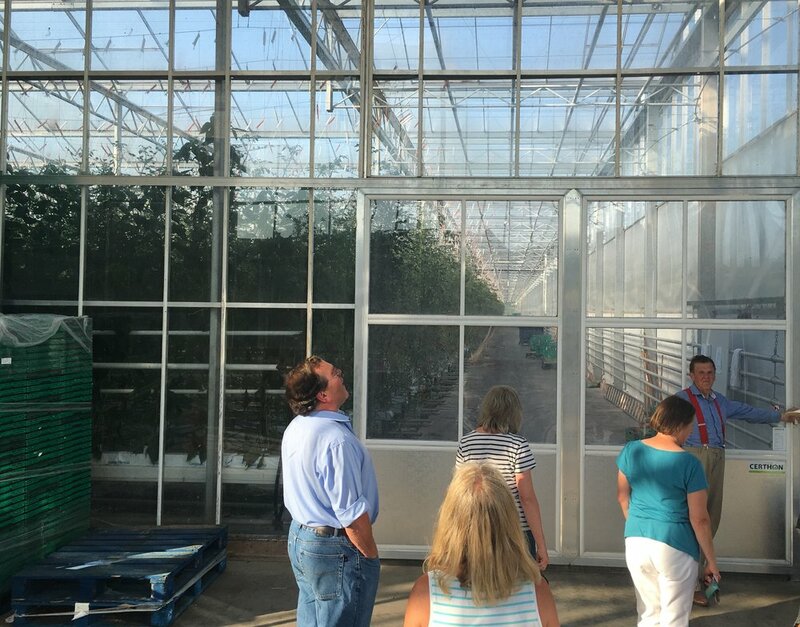 In stark contrast to the stone barns and hanging baskets of the farm, the colossal greenhouse is higher than a house and covers more ground than a couple of football pitches. We were met by Jim (the elder) and Annie Shanks, whose son Jim runs the operation; she dressed for the balmy summer evening, and he wearing a shirt and old fashioned red braces with high-waisted trousers. To my mind, silver onesies and mirrored visors would have seemed more in keeping with the surroundings. As they and their ancient collie led us to the entrance, I was struck by how very, very tiny we all looked. Annie explains the growing system. We tend to think of the best tomatoes as coming from Italy & other hot Mediterranean countries, but the Netherlands is Europe’s 3rd largest producer with a climate more similar to ours than Spain - the primary producer. But seeing as tomatoes are the most commonly consumed fruit in Scotland, it would make sense for us to grow our own. We used to produce plenty in the Clyde Valley, but production dropped off in the 1970s in the face of cheap international imports. But the fact remains that tomato varieties suitable for international transport tend to be tasteless balls of water. What a waste of energy, transporting all that weight just for a thoroughly mediocre eating experience. The roots of each colossal plant are contained in seemingly impossibly small cubes. However, surely producing these heat-loving crops in Scotland would require crazy amounts of energy and negate any carbon saved in transport? This is where technology steps in. 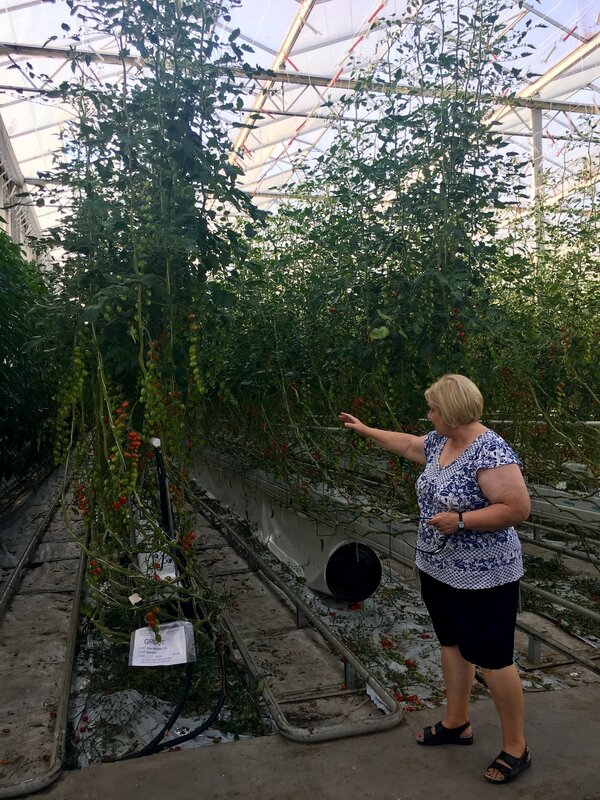 As in the Netherlands, tomatoes at Standhill rely entirely on hi-tech equipment for their success (and a lot of it - the Shanks’ greenhouse cost around £2m) rather than our capricious weather. In fact, Standhill tomato plants all originate from a Dutch producer, being shipped over to Scotland in January as starts, and never being removed from the small sturdy root cubes they begin in. They don’t require soil to grow, which not only negates carbon intensive transport of heavy growing mediums, but also removes the possibility of soil-transmitted diseases and therefore reduces the needs for fungicides. Instead, they are fed pre-diluted fertilizers & minerals hydroponically. A sci-fi like system of pipes and drip feeders supply the plants and also recycle unused water to maximize efficiency. But toms can’t live on NPK alone, they also require heat and light for size and flavor – things that Scotland has uncharacteristically had lots of recently, but which are generally pretty darn rare. Annie explained that the glass itself is where much of the technology lies, being specially developed to allow more and better light through to the plants. And light is plentiful in Scotland where we have much longer days during the growing season. The production season for the Standhill plants is incredibly long, starting in late March and ending in November when they rip everything out and clean down the greenhouse for a January start. This means that the plants have the chance to grow, and grow, and grow. My mother, who can be considered small at the best of times, looked positively miniscule next to these mammoths. I could see her mentally picturing her own domestic tomato plants as she stared up at the ceiling. The Standhill tomatoes are tethered to strings which let down as the plants grow, and their ever lengthening stems are then tucked around their base in a spiral. This keeps the productive part of the plant at the same height, for ease of harvest. With a bit of tech support, Scotland was beginning to look more and more favourable for sustainable tomato production. This is not a bumblebee: this is Natupol! Every now and again, the uniformity of the rows is disrupted by bright yellow and white boxes perched in amongst the winding stems. On closer investigation, these turned out to be artificial bumblebee nests. Bumbles effectively pollinate the plants, and certainly give the place a less clinical feel. However, they’re only present to pollinate, not to procreate and nest build. They’re replaced every 10 weeks, which made me wonder about the industrial bumblebee production that must be happening at a crazy scale somewhere. The other uncomfortable thing was the evident and prolific waste. Tons of tomatoes littered the floor under the plants (overripe or fruit that is accidentally knocked off) and filled huge containers (misshapen and undersized fruits). But this, assured our hosts, was unavoidable. We joked, without laughing, about the amount of chutney or soup that could be made. We were each given a tomato to taste, which Jim had to be very careful in selecting, so as not to ruin any of the ‘sets’ for the supermarkets. Almost the entire crop this year is going to Morrisons, but a few local outlets stock them, including the Denholm village post-office where I get them. Before we left, Jim proudly showed us the area where the liquid feed is mixed. These vats, pipes and giant encrusted baths are not the stuff of bucolic foodie fantasy, but clearly, at the scale Standhill is producing at, they are necessary. I left feeling awestruck by the scale and pleasantly surprised by the sustainability of the production. Our hosts are rightfully proud of what they and their son does, and have shown guests such as Princes Anne and Andrew Fairlie around the plant. Having previously owned and abandoned an economically unsustainable artisan cheesemaking operation, they are open and unapologetic about their ambition for scale with the tomatoes. The greenhouse alone shows they are taking this seriously. They know that in order to survive and thrive in the supermarket oriented food economy, anything less would fail. But this does not have to come at the cost of quality, nor does it have to be environmentally or socially irresponsible. Scotland wants to eat a lot of tomatoes, and no artisan production is going to be able to meet that demand, much as we might like the idea. And why not make sure the tomatoes we eat taste good and are produced to high standards? When you buy from my local post office, the tomatoes haven’t been stored or refrigerated and so have retained their fragrant natural oils and still have most of their sugars and nutrients. Artisan it ain’t, but I'll happily continue to eat this tasty product, particularly now I've seen how it's produced.